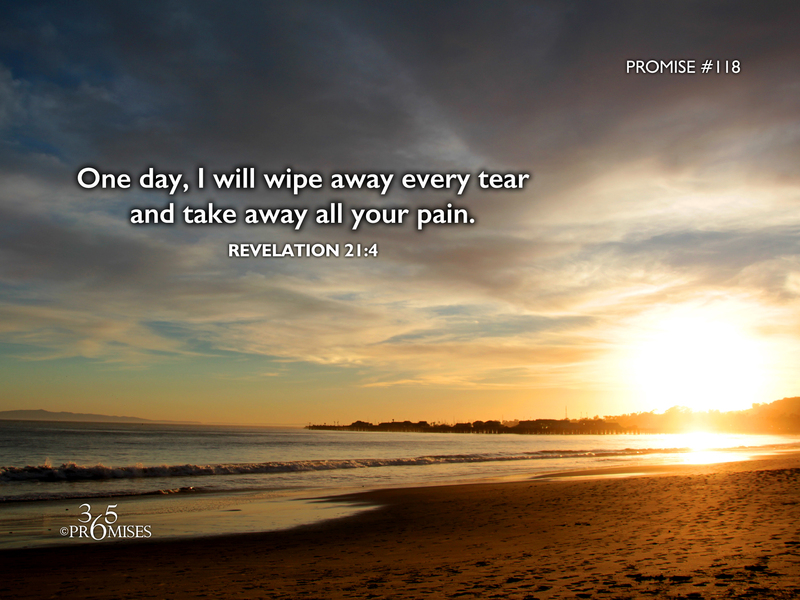 Today's promise tells us of a day that is coming when God Himself will wipe away every tear from our eye. On that great and glorious day, there will be no more death, no more sorrow, no more reason for tears and no more pain. All of the memories of the suffering of this world will vanish in the light and love of our Father's embrace. God Himself will wipe away every tear that we have cried and He promises to take away all the pain that we have suffered on this earth. May this promise bring hope to those who are in the midst of difficult circumstances. May this promise bring comfort to those who are grieving the loss of a loved one. One day, we will see Jesus face to face and we will be taken up on the lap our Heavenly Father. May this promise bring much joy to our hearts and anticipation to living forever in the embrace of the One who loves us with an everlasting love.